You love pork belly, I know you do. You saw that pork crackling right there and thought – PORK BELLY! Look at that crackling! But, with miso? I loved this, but I do wonder if it is even worth messing about with pork belly at all. It tastes so great on its own, maybe teased a little with fennel or given a dusting of cumin sparkle. But I had this idea in my head and I just couldn’t get it out. I had to try it. Miso and pork is not a new combination. What it is is a superb combination. Buta miso udon is a delicious udon noodle soup with pork, for example. I wanted to try marinading pork belly in a miso marinade before roasting it, just to see how that would go. I love it. There are so many different miso pastes. They really vary in taste from the dark and intense hatcho miso to the lighter white miso which I prefer for this. But you know, use whatever you can get. The marinade is simple, just two ingredients: miso & sake. Skin! Crispy, crispy skin. Are you worried that maybe you won’t get a skin as perfect as the one in my photo? It really is easy, you just need to follow a few steps. Take care not to get any marinade on the skin – dry skin makes great crackling. Cut the skin with a sharp knife or razor blade (although I am a little afraid of them), taking care not to cut as far as the flesh. Flesh contains moisture and if you cut that far the escaping moisture will prevent your skin crisping, and the meat will be a little drier. Which you don’t want. Before putting it in the oven, pour boiling water over the skin and let it puff up. Then dry it. Make sure the skin is completely dry. When you salt the skin it will draw water out so salt the skin just before you put it in the oven. I just use kitchen towel but you can go so far as to use a hair dryer – it works! Put it in the oven at the highest heat (220 – 250 depending on your oven) and let it crisp for 15 minutes. If at the end it still isn’t crisp, blast it again for 5 – 10 minutes or put it under a hot grill – but watch it closely! Got it? Ok, lets go! Prepare your marinade by combining the miso and sake and mixing well. Prepare the pork skin by cutting lines in the skin with a sharp knife or blade, taking care to cut just to the fat below, not the flesh (see previous page for details on perfect crackling!). Pour boiling water over the skin and watch it puff up – this really helps. Dry with skin with kitchen towel. Rub the marinade into the flesh (sides and bottom), taking care not to get any on the skin. Let marinade for an hour at least, 4 hours preferably, in the fridge. Leave the meat uncovered as the skin will dry further in the fridge environment. Take the meat out a half an hour before you plan to cook it (an hour if you have time), and let it come to room temperature so that it roasts evenly. 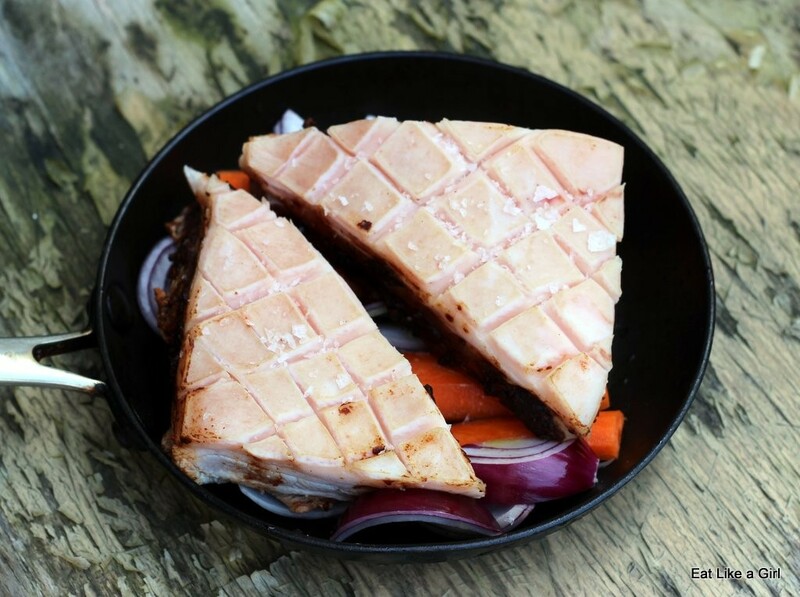 Prepare your roasting dish by creating a vegetable layer which acts as a very tasty trivet for the pork. I just love roast garlic too, which is why that is there. Preheat the oven to as hot as it will go up to 250 deg C. Dry the skin one last time and rub in some sea salt just before it goes into the oven (if you salt earlier it will draw moisture out and compromise the crackling). Let the pork roast at a high heat for 15 minutes, then reduce the temperature to 170 deg C and roast for a further hour. The skin should be perfect at this point, but if not, blast it for another 5 – 10 minutes at a high temperature, watching it to make sure it doesn’t burn, or put it under a hot grill, but do watch it closely as it is very easy to burn it. Let rest for 10 minutes and tuck in.